Critical Design Objectives in Electronics application include efficient thermal management, ability to withstand Shock and Vibratoin and better performance considering fit, form and functional requirements. 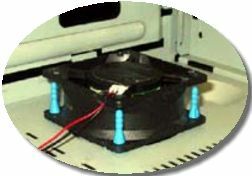 Necessarily the mechanical considerations such as mounting methods, placement of heat sinks, passive and active elimination of thermal and mechanical shocks affect the performance of electronic equipments. 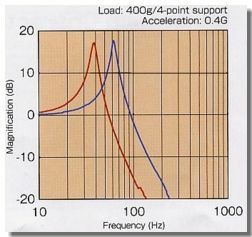 Noise control, vibration elimination and cost reduction become focus of design consideration when development of successful designs with superior performance is no longer a secondary objective. SolidWorks Simulation and SolidWorks Flow Simulation deliver no-compromise solutions while addressing critical challenges in the areas of performance providing cross-functional design engineering teams, comprising of mechanical and electrical/ electronics engineers, with rich toolsets to make empowered decisions at the right time. This approach has saved time and money for many engineering corporations world wide resulting in fail-safe designs of superior quality and function. Overheating of electronic devices result in mal-functioning, breakage and reduced up-time leading to reduced reliability and higher costs of replacement. Thermal management is a critical function that needs to meet desired results, to ensure the fail-safe performance of sophisticated and wide ranging electronic equipments. 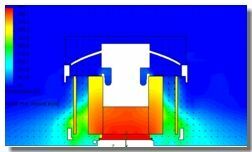 Choice between natural heat dissipation and forced cooling is always made after considerable amount of debate. 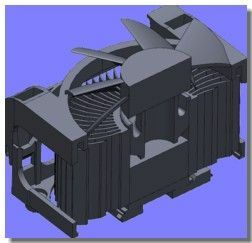 Forced cooling using Fans come with better thermal performance and higher Mean Time Between Failure (MTBF) for the electronic devices. However, the Fan system needs to be Reliable, Less energy consuming, noiseless and have a lower vibration foot-print while keeping the costs low. 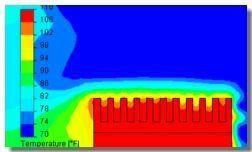 Such challenges weigh in the minds of designers before choices are made in thermal management. SolidWorks Simulation and SolidWorks Flow Simulation helps designers achieve efficient and better designs with reliable estimates of performance up-front leading to low cost, more reliable and highly efficient systems that deliver all the time. 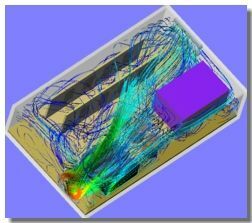 Time and again, design engineers have relied on SolidWorks Simulation to perform numerous simulations to assess response to shock and vibrations. MIL STD, NAVSEA standards for Shock provide guidelines for shock calculation procedures and acceptability criteria that are solved easily using SolidWorks Simulation. Re-design of anti-vibration mounts, peak response calculations, life usage factor estimation are accomplished using SolidWorks Simulation.